Even 90+ years after the event we still see daily reminders of the terrible impact of the Great War - through the 1,000s of local war memorials. In addition to the public memorials each family of a service person who died received a personalised Memorial Plaque. This was often referred to as a Death Penny despite being much larger than any coin. In fact, it was about 8cm across - much the same size as a modern CD / DVD. It was cast in bronze / gunmetal. Often they were mounted in frames or drilled to be hung on walls. Many still survive even though the paper work to identify the exact person that died has been lost. Estimates have put the total figure produced at 1,150,000. 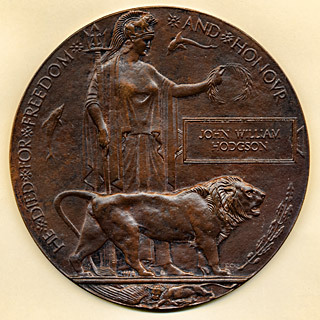 This particular Memorial Plaque for John William Hodgson is not thought to have any connection to the local Hodgson families - and exactly who it was issued to has been forgotten. 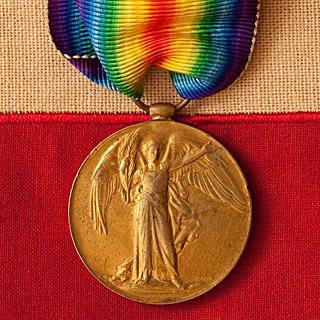 The World War 1 medal most commonly found today is The Victory Medal 1914-1919. It was authorised in 1919 and was awarded to personnel who served on the establishment of a unit in an operational theatre of war. The Imperial War Museum state that 5,725,000 were issued. Often they have lost their ribbons but modern replacements are widely available. 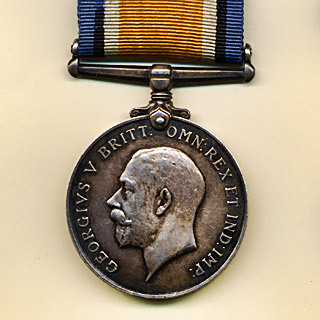 The British War Medal 1914-1920 was awarded to eligible service personnel and civilians. Qualification for the award varied slightly according to service. The basic requirement for army personnel and civilians was that they either entered a theatre of war, or rendered approved service overseas between 5 August 1914 and 11 November 1918. Service in Russia in 1919 and 1920 also qualified for the award. The 1914/15 Star was awarded to those individuals who saw service in France and Flanders from 23 November 1914 to 31 December 1915, and to those individuals who saw service in any other operational theatre from 5 August 1914 to 31 December 1915. As you may imagine far fewer of these medals were issued (2,078,183) than the Victory or BWM. 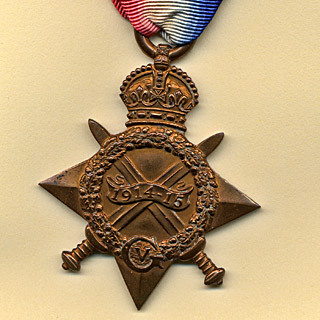 The 1914 Star was awarded for service ashore in France and Flanders between 5 August and 22 November 1914. In 1919 a clasp bearing the above dates was authorised and given to those individuals who had actually been under fire between the prescribed dates. The rarest of these four medals with 365,622 issued. 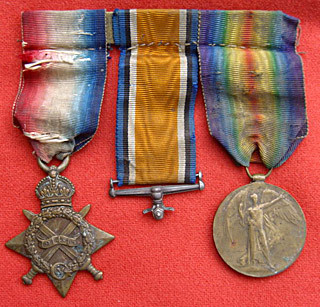 Those who served during 1915, or before, met the qualifications and survived became entitled all three medals - one of the two Stars plus the British War and Victory medals. This example set - spotted on e-bay - shows how time can take its toll - and that the value of the silver in the British War Medal did reduce the numbers that survive. 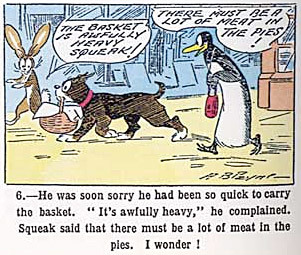 After the War the three medals were often referred to as “Pip, Squeak and Wilfred” after the characters (a dog, penguin and rabbit respectively) that appeared in a Daily Mirror comic strip in May 1919 and became hugely popular. See the web sites of the Commonwealth War Graves Commission and the National Archives World War One Medal Cards for more.